In his second solo show at Marcia Burtt Gallery, Erling Sjovold exhibits paintings that are opulent, serene and as precisely rendered as 17th-century panels. 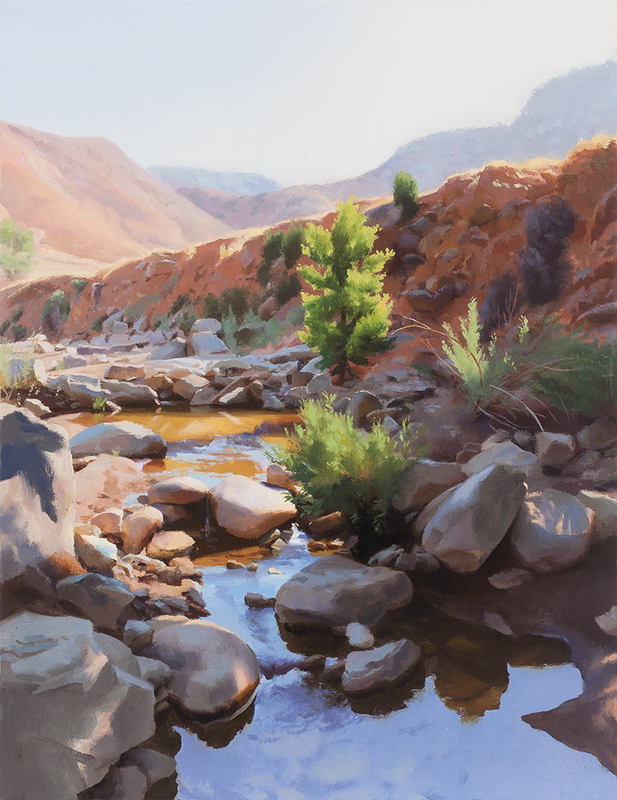 The smaller paintings result from naturalistic observation and result in radiant landscape series of the Agua Caliente area of Santa Barbara’s backcountry or the high desert. Sjovold’s larger paintings create mysterious hybrid spaces, a fictive world based on fragments of lived and observed places. These places are both familiar and unfamiliar; they never fully reveal themselves and obscure a precise time, place, or story. The imaginative spaces he paints create an uncanny and nagging sense that something is known but not articulated. Erling Sjovold grew up in Santa Barbara, graduated from Cal Berkeley, and lived in the upper Mojave desert before leaving California in his mid-twenties to pursue an MFA at The School of the Art Institute in Chicago. Although Sjovold now teaches at the University of Richmond in Virginia, his work shows the deep influence of camping and backpacking trips in California when he was a child. Sjovold has enjoyed a number of grants and residency awards including the Marie Walsh Sharpe Art Foundation Space Program, Ragdale, The Center for Land Use Interpretation, Virginia Center for Creative Arts, Jessie Ball DuPont Summer Fellowship at the National Center for the Humanities, and the Virginia Museum of Fine Arts Fellowship. A 40 page catalog of this exhibit is available in the gallery.